Since 2013 I have been involved in Sarantaporo.gr Community Broadband Network, an initiative of local inhabitants from Sarantaporo village. The village is located in Elassona, central Greece, neighboring mountain Olympus. Starting as a small initiative in 2010 by a group of friends who wished to provide their village with basic Internet connectivity, today Sarantaporo.gr Community Network counts 14 villages and serves 5.000 local inhabitants and twice as many visitors throughout the year. One of the many secrets of its success has been the openness of the core team and the tireless pursue of collaboration with diverse, multidisciplinary stakeholders. During the last weekend of November (2016) we organized a meeting1 with selected participants2 in Milea, one of the connected villages, in which we invited local farmers and herders to sit in the same table with representatives from academia, research, startups, social economy, enterprises and Sarantaporo.gr. The day-long meeting was organized as a participatory design workshop aiming to reveal collaboration opportunities towards creating solutions for local economy problems. Access to markets, local weather conditions monitoring and forecasting, adoption of new technologies in a conservative environment, were some of the major production-related problems that were identified by the local professionals. Social problems such as social cohesion in remote areas were also identified as important priorities. In the course of discussion the need arose to review best practices from other areas, which was partially fulfilled by the presentations of the participants. The presentations included, among others, the Sarantaporo.gr Community Network, the use-case of the French L’atelier Paysan, the GAIA INFARM smart farming solutions and the Netcommons EU HORIZON2020 research project. It was not long after we commenced with the meeting that a number of strong synergy opportunities emerged. A local animal herder, for example, expressed his need for Internet connectivity in the farm, which GAIA could subsidize by funding the expansion of Sarantaporo.gr community network, in order for the enterprise to be able to offer its smart livestock management solution. We ended the day in excitement by committing to arrange a follow-up meeting early next year in an open event for the local communities. That was not the end, though! The meeting was expanded to the next day with a visit to Sarantaporo village and a tour to the Community Network’s infrastructure. Final destination was Sakis’ tavern in Kokkinopilos village, were we took the opportunity to socialize in a more informal way, over a wonderful meal. Yet, the uneasy spirit of the Sarantaporo.gr techies found its way to our dessert! 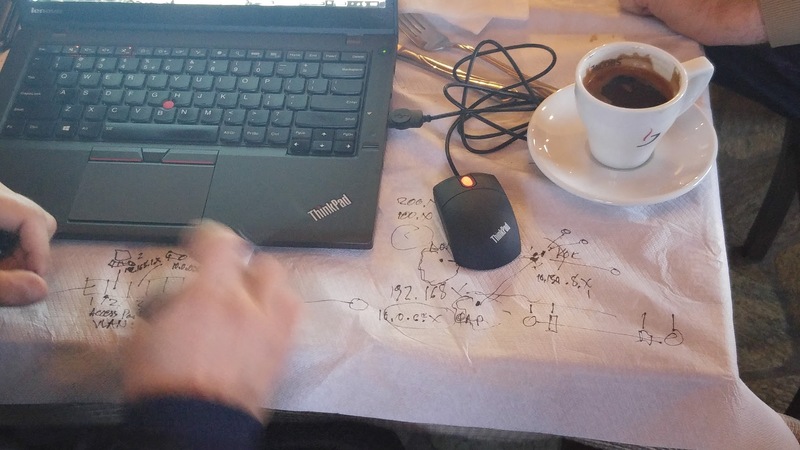 The paper tablecloth became the optimization battleground for our Community Network’s architecture, while a local inhabitant was delving into the arcane knowledge of cable patching! Enjoy, in the following (auto-generated!) video. The meeting was co-organized with Nethood and Athens University of Economics and Business in the framework of Netcommons Horizon2020 EU research project. Participants: Athens University of Economics and Business, Thessaly University of Applied Sciences, Nethood, p2pLab, Ex Machina, Impact Hub Athens, GAIA Epicheirein, Sarantaporo.gr.